In this post I wanted to review a few concealers that I have recently purchased and tried out. In my search for the best under eye concealer, I have stumbled upon a few other products that I just couldn’t ignore. Well, a couple of good things came out of this. First – I discovered the highlighting capabilities of some concealers, second – new and improved applicators, and third – if you want the best face – you have to combine your products! So, here it goes, my review of four concealers and what I learned while playing around with them. As you might have seen, Maybelline came out with a new under eye concealer that had beauty blogging world going insane. The Maybelline Age Rewind line promises not only to conceal skin’s many indiscretions, but to erase most of the visible signs of aging. I bought my Maybelline Age Rewind Dark Circle concealer for those two promised benefits. After reading many reviews and raves, and “Best Drug Store Buy” labels, I went ahead and joined the fan fair. Now here is what the product promises – it promises to erase dark circles, take away puffiness with its Haloxyl active formula and smooth out fine lines. The newly designed dispense applicator in a form of a sponge at the end of the concealer stick, is another reason why this product is highly popular. It is optimally convenient and pretty much mess and spill free. But here are my thoughts on this product. This product stays true to its shades, so you will have no problem with matching it to your skin tone. The texture is light and thin, so you won’t have a problem over applying. It blends well and easy, however you will have to apply finishing powder as this concealer leaves a greasy/oily finish. I do like the applicator idea as it is very convenient and does not pull and tug at your skin. You can simply dab the sponge in your under eye area and the product will spread out nicely. However, even though I own the smaller version of this concealer, the sponge is still too large to get into all of the corners under my eyes. Personally, I did not feel like this product provided enough coverage for me. It can be attributed to two things, either it is not thick enough for my under eye circles, or I need a different shade. Either way, it did not do the job for me. It also caked up to wards the end of the day and totally got into my fine lines. With that said, I do not think that I will be purchasing Maybelline’s Age Rewind Eraser for Dark Circles again. This is a brightening concealer as well as a highlighter, so a nice little two in one. Because this is a highlighter, you can use this product around your entire face, specifically sides of your nose, top of forehead and cheekbones. What I love about this guy is that it is a pen with a brush on the end to dispense your concealer. This provides for a very easy application and you can get into all of the nooks and crannies. 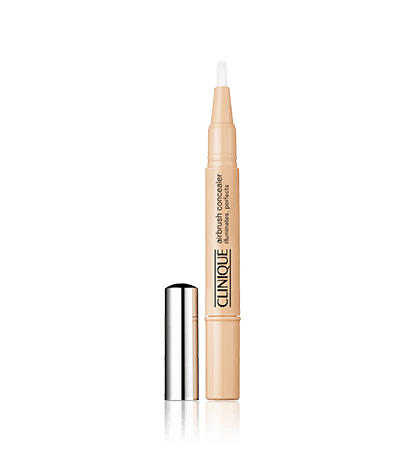 Concealer pen is my most favorite form as opposed to Make Up For Ever’s HD Invisible Cover Concealer that gets dispensed out of some type of a tube ending. Not knocking it, as I am sure the formulation is great, but what’s up with the casing? Quick heads up, it takes a couple of turns to get the product out, and once it is out be careful not to over dispense. Just take it easy, one click at a time. Anyhow, Maybelline Dream Lumi will definitely highlight if that is what you are looking for. I tried it for both, under eye coverage and highlighting, and the latter produced much better results. The texture of this product is not too thin and not too thick, it is actually just right! This product blends easily, leaving a non greasy finish, however personally it did not eliminate my under eye circles completely. It did do a better job than Maybelline Age Rewind, and I credit the highlighting formula for that. I did apply a finishing powder on top, and towards the end of the day Lumi did get a bit cakey, but no fine lines! #Winning! So I would say that in my case this product is great for overall highlighting, but not under eyes so much. The pen does run out quick, so I see myself going through about one per month, but it is very affordable ($7.99 depending where you are buying it from. Target has the best price, at $ 5.79). Will I buy it again? YES, I will! Another two in one – concealer with highlighting capabilities. This product was created to minimize wrinkles and fine lines and it does exactly that. I tried it both ways, for under eyes and all over the face for a highlighting effect. I must admit, Maybelline’s Dream Lumi Touch does a much better job at highlighting, but Clinique wins in the under eye coverage department. Once again, love the brush applicator and the fact that this product applies very light, giving you control in terms of how much you are looking to cover. This formula is definitely buildable, very sheer and has a matte finish! I still slap some finishing powder, but you do not have to. At the end of the day this product did not cake up, and my fine lines were not noticeable. As you might have guessed, I will be restocking on this product and making it one of my permanent beauty buys. On a side note, this concealer comes in many shades, so another bonus for this baby! This was a spur of the moment purchase! I was looking for eye shadows, and this just popped out of nowhere, and at $3 per pop, who am I not to buy it? This one is a typical concealer bottle with a wand, it promises to firm skin, minimize fine lines and even out skin tone. Its formula contains vitamin C, green tea and mulberry for lifting, soothing and improving skin texture. I am not a big fan of the wand, but better than a sponge! This formula is pretty thick, but it is easily blendable with a matte finish, and it provided great under eye coverage. I still noticed some fine lines, but not as much and this product did a bit of caking towards the end of day. I also tried this concealer as spot treatment and I must say, I was very pleased with the results. So will I buy this again? Absolutely! What are your favorite concealers? Leave your comments below! I am always looking to hear about new and exciting products in the world of make up.